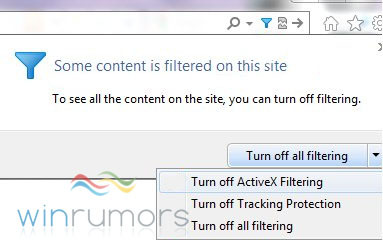 According to sources close to the project, ActiveX filtering will be a part of the Internet Explorer 9 Release Candidate. According to WinRumors: “The filter will allow users to control what ActiveX elements are displayed on sites they visit, furthering Microsoft’s commitment to security within its browser.” We have been covering Internet Explorer 9 extensively in recent weeks, especially with regards to the browser’s HTML5 compliance. The Internet Explorer 9 beta has been exceptionally popular thus far, despite Microsoft only infrequently updating the consumer-facing version. Much of the update cycle for the beta has been in developer previews that lack a user interface. We are anticipating a major update to IE9 in the first quarter of 2011, it could be that ActiveX filtering will be present in that build. We are awaiting comment from Microsoft.